In the beginning, the program’s menus included foods that were fried and breaded. Water was made available, but it was only located outside the classrooms. Lopez began working with food vendors to find healthier food options to serve in their program. With the vendors’ help, the program’s menu changed. Whole grain breads, whole wheat pasta, brown rice and fresh fruit were served. Additionally, 100% fruit juice was limited to 4-6 ounces daily. The children, program staff and families responded wonderfully to the changes. 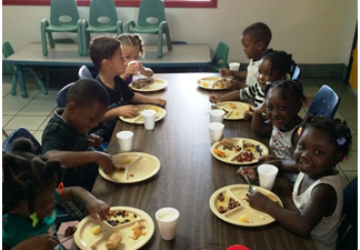 The children became more involved in trying new and healthy foods and began to enjoy eating their meals together. Program staff used MyPlate Healthy Food Play Sets in the classrooms to engage children in creating menus, cooking and serving healthy foods. At the Neighborhood House Association (NHA) Head Start in San Diego, California, Director of Nutrition Services and the Nutrition Services chef teamed up to overhaul the menu to make preschool meals healthier. Early care and education programs who receive food program (CACFP) assistance should now be in compliance with new meal pattern guidelines (effective October 1, 2017).